Cattle supply continues to track higher in saleyards, and price lower. After a bit of a bounce two weeks ago, dry weather and more numbers resumed the slide, with the EYCI this week hitting a 26 month low. 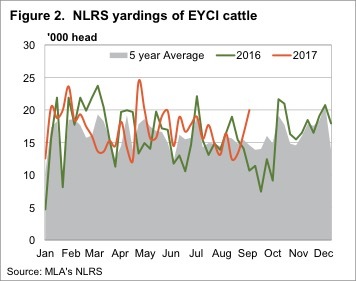 A couple of weeks ago we wrote in this column that the Eastern Young Cattle Indicator (EYCI), and cattle prices in general, might have found a floor. Turns out we were wrong. Figure 1 shows the EYCI falling below the spring lows of 2015, and heading towards 500¢. While weakening demand has been playing its part in lower prices, this week supply was the culprit. Figure 2 shows EYCI yardings hit an 18 week high, and were, in fact the strongest September yardings on record. Rainfall and grain prices are not helping demand. Since late August ASX East Coast Wheat Futures have gained $25, with feed values rising in sympathy. This is obviously continuing to pressure lotfeeders. There wasn’t a lot of joy for any cattle types this week. 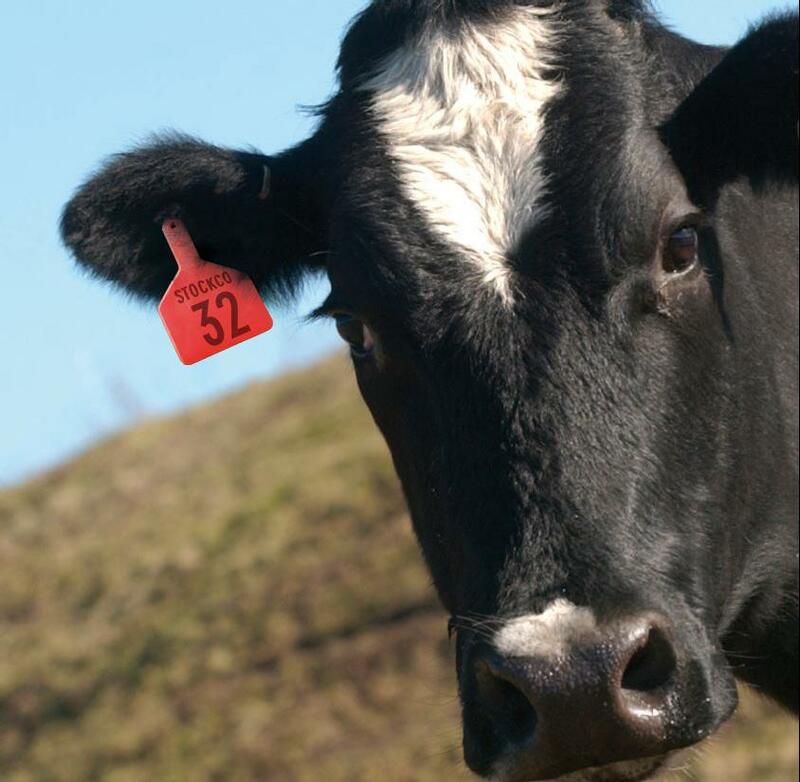 All state domestic feeder steer indicators have fallen back under 300¢, except in South Australia. Heavy Steers are just above 500¢ in Victoria and SA, but look destined to break this support level as well. 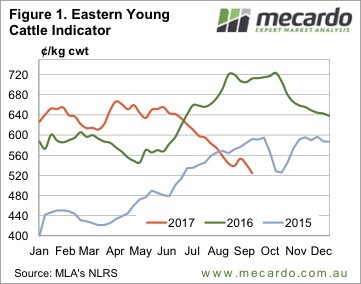 Over in WA the Western Young Cattle Indicator (WYCI) has also weakened, but only eased 6¢ to 589¢/kg cwt. Unlike the EYCI, which is sitting 26% below this time last year, the WYCI is just 4.7% lower, so things aren’t too bad for WA producers. Once again there is no rain on the forecast for major cattle areas, so we don’t expect prices to rise any time soon. There is some good news though, the longer cattle prices continue to fall, and the more cattle are liquidated, the better prices will be in the medium term if it ever rains again.